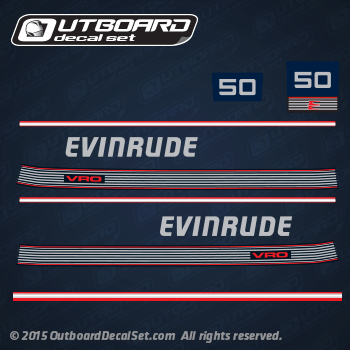 Evinrude 50 hp VRO decal set replica for 1989, 1990, 1991 Evinrude Outboard engine covers. EVINRUDE 1989 E50BECEC, E50BELCE, E50TELCEC, E50TLCEC, TE40ELCEC, TE50TLCEC, TE50TLESF. EVINRUDE 1990 E50BEESR , E50BEESR, E50BELESR , E50BELESR, E50TELESR , E50TELESR, E50TLESR , E50TLESR, TE50TLESF , TE50TLESF, TE50TLESR , TE50TLESR, VE50BEESR , VE50BEESR, VE50BELESR , VE50BELESR, VE50TLESR , VE50TLESR. EVINRUDE 1991 E50BEEIA , E50BEEIA, E50BELEIA , E50BELEIA, E50JEIA , E50JEIA, E50TELEIA , E50TELEIA, E50TLEIA , E50TLEIA, VE50BEEIA , VE50BEEIA, VE50BELEIA , VE50BELEIA, VE50TLEIA , VE50TLEIA.